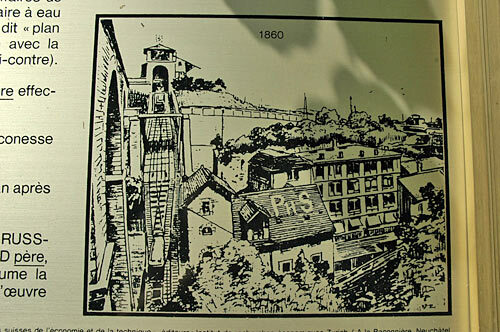 A Funimag reader informed me that there was a funicular in the Suchard chocolate factory, he saw an old picture of this funicular in a local museum, he took a photo of the photo and sent it to me... the funicular was visible but the photo was not a good quality document and it was very difficult to locate the place where was the funicular. This document is the first I had about the "Suchard" funicular. You can see distinctly the "CHOCOLAT SUCHARD" inscription! 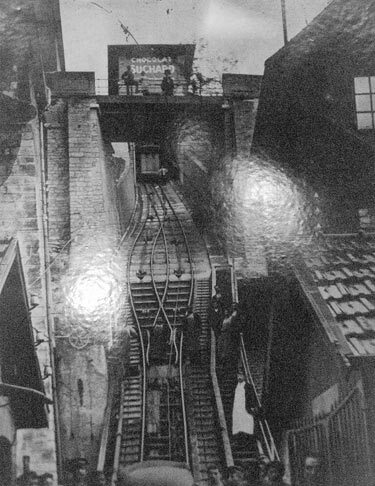 On the face of it we can suppose that the funicular was an integral part of the chocolate factory. In spite of its defaults, this document is very interesting... note all these workers posing for the photographer spread on the funicular track and also on the bridge crossing the track! Around the lower carriage, we can even distinguish their faces! 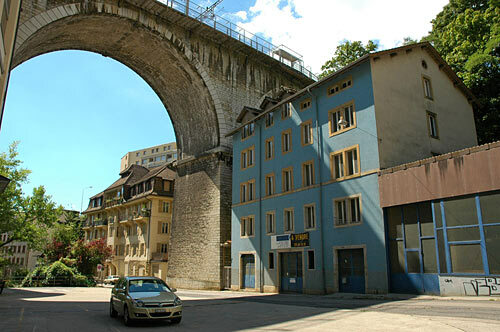 On April 2005, I went to Neuchatel with this photo in my pocket... looking for the Suchard chocolate factory. In fact I didn't even know before that these factories were located in Neuchatel! I learnt soon that the factories were, in fact, located at Serrieres which is part of the Neuchatel city... to be more precise, in the south-west of the city, in the Serriere dale. Once arrived at the Serrieres train station, the first thing I noticed was this big red building with "CHOCOLAT SUCAHRD" written down the roof! 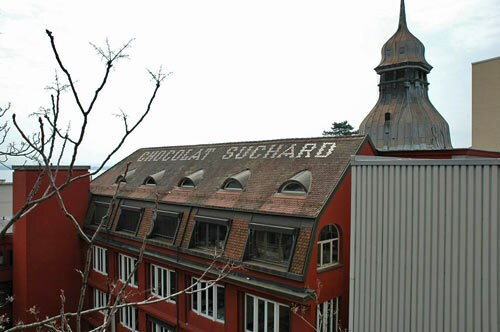 April 2005: Old building of the Suchard chocolate factory... there is no more chocolate factory in the dale! Unfortunately, I didn't see anything more in the dale...! No trace or remaining of the funicular... even no hypothesis for its old location! Empty-handed return to Paris! In August 2005... second expedition to Neuchatel-Serrieres! That time, I decided to come up the dale from the north face. I had noted that there is a path going down to the dale from behind the Beauregard Castle. The obstacle, it is an inclined plane! 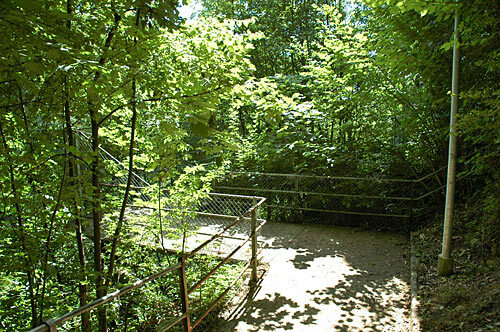 Under the heavy vegetation, I can detect some rails, rollers... it is the remaining of the second funicular. I call it Les Battieux inclined plane... Les Battieux is the name of the area which is just above the incline. Following my way down the dale, I arrived near the Serriere river spring. There, some notice boards tell the industrial history of the Serrieres dale... in particular I noticed one notice board... it shows the Suchard chocolate factory funicular! On one of the notice board, the Suchard funicular with the date 1860! We will see later that this date is not correct! 1860, it is the date of the opening of the Jura-Simplon railway line. The funicular will be built later! Lets continue my visit in the dale... I meet the first buildings which replaced those of the papermaking industry. Now, they are buildings of a famous american tobacco company which bought the Jacobs Suchard chocolate factory some years ago! But... was it on the west side?... or the east side? 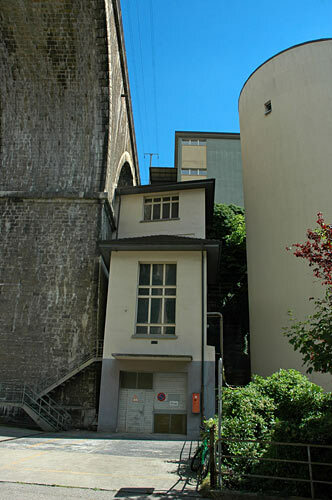 In either of the two possibilities, we can say that nothing is remaining from the funicular! Back to Paris again, I did not learn a lot about the Suchard funicular... but I took some pictures of the Les Battieux inclined plane! Then, beginning of December 2005, I found a blog about Neuchatel-Serrieres! Apparently the blog was created by someone who lives there or at least who know the area very well. I sent a request to the blog, asking for information's about the Suchard and Battieux funiculars. 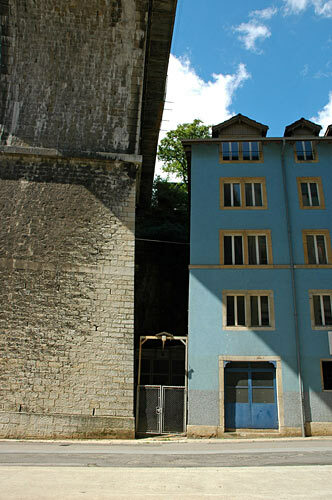 The author of the blog is very interested to make some research's on these mysterious funiculars! That's the way we collaborated together during three months, my collaborator went all over the Serriere dale but also the Neuchatel archives and museums looking for old documents and information's Together we studied these documents and photos... Now I present you the results of our research's in Funimag, issue 27 !